Buying a home can be a very prudent investment if the time is right for you because many times, a mortgage payment is cheaper than rent. However, it’s important to consider all the costs associated with owning a home, because it isn’t just the mortgage payment that you have to worry about. 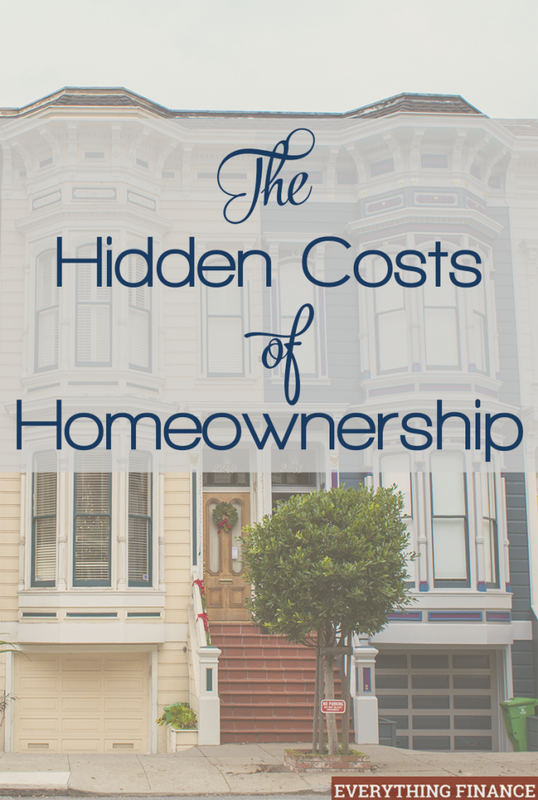 There are many hidden costs of homeownership that you need to consider as well. Today, we’re going to review what those hidden costs are so you can start preparing for them. The “fixed rate” only applies to the interest rate — and nothing else. Many mortgage loans are set up with an escrow account for property taxes and homeowner’s insurance, which is added onto your monthly payment in addition to the principal and interest payment. This means your payment can (and probably will) adjust up or down (but mostly up), if your taxes and insurance adjust. And one thing is for sure — they will adjust. When I worked in the mortgage industry, I had a previous client call me very upset that their payment had gone up by 6 dollars. I had to politely explain it had nothing to do with their mortgage or their interest rate, and everything to do with their homeowner’s insurance. I then suggested they call their homeowner’s agent to see what he could do. When I bought my house, I took a copy of my appraisal for the foreclosure I purchased to the tax assessor. I wanted to get my tax bill adjusted down since the tax rate was much higher. That simple move alone saved me $500 that year — not exactly pocket change. It’s important to realize that if you’re already maxing out your budget for a new home, an adjustment in your escrow account could really affect your budget. It could even determine whether or not you can afford your home. This is another good reason not to max out your housing budget if you can avoid it. After you’ve held your insurance policy for more than a year, the premiums don’t typically adjust down in price. This is why it’s important to shop around for your insurance as much as you’re comfortable with. Aim for at least once a year. Save yourself some dough by shopping this policy around, and the insurance company will work with your lender on getting your escrow account — and mortgage payment — adjusted accordingly. I shop my homeowner’s insurance policy around every year. I love seeing my mortgage payment go down, even if it’s only a few bucks. You have to pay for mortgage insurance (MI) if you don’t have 20% as a down payment. Once your loan-to-value ratio reaches 80%, your MI is supposed to fall off. However, unless you call your mortgage company and ask them to remove it from you payment, your MI doesn’t automatically fall off until you reach 78% loan-to-value. Depending on your loan amount and the amount you pay in MI, this could save you a chunk of change. Avoid this slip up with a simple call to your mortgage company! All homes come with utility payments. This is nothing new. But if you’re house shopping, it’s not a bad idea to ask the sellers of the home for copies of their latest utility bills. This will give you an idea of whether or not the home fits into your budget, and you can also avoid any unpleasant surprises with your utility bills after you move in. This is especially important if you’re moving to an area that you’ve never lived in before. You wouldn’t want to realize you’re going to blow your budget after you’ve purchased the house. The most important piece of your loan documents is often one that is overlooked by many borrowers because it’s very confusing: the truth-in-lending statement. However, it’s worth taking a look at because it contains a lot of valuable information. The main thing you want to look for is the total amount of payments you will have made if you pay your home off in the term of your loan (10, 20, 25, or 30 years). Your monthly payment may not sound like much on a per-month basis, especially if you got a great interest rate, but over the term of the loan, you’re going to pay a ton toward interest. The total monthly payment box clearly states exactly what you’ll have paid in total for your home once the term is up. Your home may have only cost $150,000, but when you see that the total of payments is closer to $225,000, it’s a sobering look at the cost of financing and interest payments. It’s a lot more than you may realize. Many condos, town homes, and houses in communities have homeowner’s associations (HOA). We recommend condo financial management services for financial accounting services. These entities manage the residences in a particular neighborhood. HOAs collect a monthly fee from its residents, and this fee can include anything from maintaining the community pool to mowing the grass at the entrance to the neighborhood. If you buy a home in an HOA neighborhood, double check the fee and the restrictions. Some even regulate whether or not you can leave your garage door open or have a boat or camper in the driveway, which can be a tough pill to swallow when you own your own home. There are also restrictions with the size of your driveway gate but with rv gates you won’t have that problem as they already come with the right measurements for special security and to have a safer driveway without thinking about the HOA. Even if you pay off your home, you will continue to pay HOA fees, and these fees can increase, so it’s important to know the HOA process to avoid unpleasant surprises down the road. Although they are beautiful, when you purchase a home on the Historic Registry, you’re likely opening yourself up to a home with high repair costs. You may be able to land a great deal on one of these homes, but if you want to alter or replace anything in the home, you may have to get it approved before you can do so. For example, if you want to replace your front door or upgrade to energy efficient windows, you must have the type of door or windows you want approved first. Oftentimes, the approved building materials are at a premium compared to the economical varieties you can find at your local big box store, because they need to “look” historical. You can’t just purchase the cheapest doors or windows available. Sometimes you even have to get your exterior paint color approved. When I was looking to purchase my first home and trying to find that perfect vintage charmer, I found a gorgeous 100-year old property in a really cute neighborhood. I slept on the decision for several nights and ultimately decided it wasn’t the right decision for me. I don’t know about you, but I don’t want anyone telling me what I can and can’t do to my own home! It’s very easy to become starry-eyed when you spot your dream home. It doesn’t matter if it’s stretching your already-strained budget — you want it and you’ve got to have it! But dial it down. Take a step back. Sleep on it for a few days. Buying a house is a business transaction, so try and keep your emotions out of it. If you purchase a home that’s already out of your budget, you risk not being able to furnish it and pay the utility bills. Nothing will ruin your love for your new home faster than realizing that you can’t actually afford it. When I bought my second (and current) house, it was important to me to buy far less than the bank told me I could borrow, because I didn’t want to be house poor. This allowed me to free up my money for other expenses, and I never have to worry about making my house payment, which makes me breathe easier. The important thing about home ownership is to make sure you cover all of your bases before jumping into it. You need to know what you’re getting into, and then set aside an emergency fund for any surprises. You’ll be glad you did! Hopefully being aware of these hidden costs of homeownership leave you feeling more prepared when looking for and buying your next home. Is there anything you can do to help make your neighbourhood more secure?